As part of International Women's Day, the Zurich Women's Innovation Network (WIN) hosted an event in Dublin that celebrated diversity and leadership. 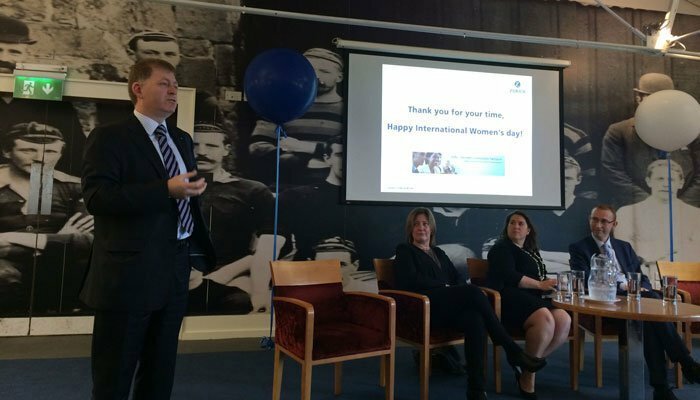 In celebration of International Women's Day, the Zurich Women's Innovation Network (WIN) hosted a breakfast session in the Zurich Blueroom at Lansdowne Football Club on March 8th. Attendees at the Zurich WIN event heard from four impressive speakers who discussed various topical issues around diversity and leadership. Alastair McMenamim, Zurich's Head of HR in Ireland and Jane Hayes, Chief Underwriting Officer for Zurich EMEA GI, spoke about how Zurich fosters diversity across the organisation. Dearbhalla Baviera, CEO and Founder of Clearbird is an executive coach and consultant who works with global organisations to develop the female leadership pipeline. Her focus at the WIN event was on growing female talent and she advised women on how to navigate their career from 'doing' to 'managing' to 'leading'. Maria Hegarty, Founder and Managing Director of Equality Strategies helps organisations deliver more effective equality and diversity policies and management strategies. She also spoke about the importance of driving diversity and reporting on the impact of this for a business. International Women's Day, originally called International Working Women's Day, is celebrated on March 8th every year and champions the social, economic, cultural and political achievements of women throughout the globe. The Zurich Women's Innovation Network (WIN) in Ireland was established with the aim of rewarding merit and accomplishment across the company. WIN focus on areas including career development and empowerment, and Zurich colleagues - male and female at all levels - are encouraged to become involved so as to collectively benefit from and support this network.